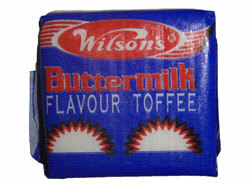 Wilson’s famous chewy buttermilk flavoured toffee. Sugar, Glucose Syrup, Non Hydrogenated Palm Oil, Corn Flour, Emulsifier (E322 from Soy), Vanilla, Flavourings. These sweets are the best tasting sweets in the world..cannot find anything else like them.